Bradford Salem v Brods''' Alex Dawson. Old Brodleians’ run of success at Shay Lane was ended when they lost 42-20 to Bradford Salem in Saturday’s Yorkshire One contest. 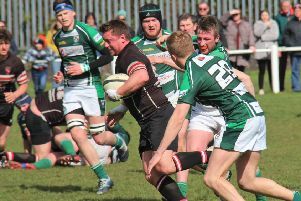 It was the Hipperholme men’s second defeat in four league matches this season. Salem were deserved winners of a hard fought game on the back of a perfect kicking display by centre Danny Belcher. His accuracy from the tee meant that Brods were constantly playing catch up rugby, the visitors’ indiscretions providing the home favourite with seven kickable penalties. That made all the difference as Brods matched their hosts in the try count. The early exchanges went Salem’s way and with two penalty goals they were 6-0 up after 14 minutes. Brods responded with their first visit to the Salem 22 and Michael Briggs showed power to break the defensive line and cross wide on the right. The conversion was missed. The home side responded strongly but bombed a certain try with a misplaced pass. However, Belched converted a penalty for offside to extend their lead to 9-5 after 20 minutes. Brods suffered a double blow when Pete Williams and Rob Jennings had to leave the field with injuries. The visitors went close following a good sequence of play but the home side broke out of defence with Sam Dunn finishing a fine move to score near the posts. Harris Morris injured himself in a desperate attempt to save the try and to add insult to injury he was yellow carded for a high tackle. Belcher converted and within minutes of the restart Matt Carbutt was also penalised and yellow carded. Belcher added the three points and Brods, down to 13 men, had their backs to the wall trailing 19-5 at half time. The visitors came out of the blocks firing with Matty Hoyle finishing a fine move to touch down in the left hand corner. Despite battling valiantly, Brods could not stem the flow of penalties and the boot of Belcher added six more points with three from Joe Potter in reply. Brods continued to press and were just in the game at 25-13. However, following a short period of line pressure by the home pack, Salem scored from close-in and Belcher converted to make it 32-13. Brods would not give up and their was no lack of effort, epitomised by Cameroon Wroot‘s strong running and hard tackling. Brods controversially had a try disallowed with Ben Hoyle ruled held up in the corner. However, the pressure continued and Jason Dodd cut through the Salem defence to score under the posts and Potter added the extras. Salem had the last say with a converted try in the closing seconds and a further penalty to Belcher.